Though there may have been some catchy tunes on her second CD, Be OK, the horrible rendition of "Somewhere Over the Rainbow" killed any interest I had in listening to it. This is her third CD, and it's definitely on par with Girls and Boys although no one song jumps out at me as a favourite. A few towards the middle are annoying repetitive though. You can listen to samples here. It's been three years since Muse's last CD, and in that time they've gotten less heavy rock and more electronica. There are a few great tracks on this CD, especially "Uprising", "Resistance", and "I Belong to You", but despite a few great builds, there are never moments of absolute explosion like "Knights of Cydonia" or "Hysteria". Other songs seem a little pointless, like "United States of Eurasia", and the highly-touted symphony at the end which seems too much like a movie soundtrack writer imitating Muse rather than a serious Muse work. I like the CD more on progressive listens, just like I did with Black Holes and Revelations. You can listen to samples here. A Fine Frenzy's first CD, One Cell In the Sea got a very mixed response from me, with the near-perfect songs like "You Picked Me" and "Rangers" dragged down by aurally irritating songs like "Think Of You". However, her sophomore effort is uniformly good, with a mix of more upbeat styles and catchy hooks, blending Ingrid Michaelson and Regina Spektor into a unique sound. The only stumble is track #10, Stood Up, which is the musical equivalent of seasickness -- a little less echo would have been nice. I have a feeling that this CD will continue to grow on me as I listen to it, just like KT Tunstall's Hold On did. You can listen to samples here. There's nothing insanely new in this episode of gameplay -- you run across the countryside and through some mines, occasionally getting bored by long noninteractive sequences that they refuse to call cutscenes, but involve you jumping around on a twelve-minute elevator ride trying to shoot the sidekick that insists on narrating your predicament. At least this time there's a couple new monsters, and you don't spend the game in a parking garage. The motions have been rehearsed, the arch has already fallen over three times, and the outdoor ceremony weather forecast calls for a high of 79 and mostly sunny skies. We have a beautiful cake done by Anna's mom, and tiny gnomes with leopard spots will support Rebecca's train as she walks down the aisle to a wedding soundtrack that prominently features the trumpet and/or cornet. Everything that can be done ahead of time has been done, and all that's left is to enjoy the fruits of our labour (especially grapes, fermented). Tomorrow after 5 PM, Rebecca and I will get married in the Blue Ridge Mountains, just 364 days after I proposed, and 6 days before Mike (of Mike and Chompy) turns 30 and likely dies. After tomorrow, the URI! Zone and BU's house will have to slide the cats over to make room for BU's wife (and perhaps in two to three years, there will be children in the BUterus). I'm not sure how this momentous event will affect the posts on this website, but I imagine there will be a drastic reduction in the level of angst, cynicism, caustic vitriol, and misanthropic mayhem, followed by a statistically significant upswing in hugs and reviews of CDs of chicks that sing. Until tomorrow, though, I'll be spending this evening in solitude, having a glass of pinot noir, and recalling the wonderful memories of singlehood, like the time I worked 80 hours a week for two months in 2005, the time I played World of Warcraft for 80 hours a week for two months in 2006 (honour-grinding), and the time I crashed a wedding and picked up Rachel McAdams and they made a movie about me. Next week, I'll definitely try to post some Hawaii pictures to show you just how awesome it is where you aren't, and when full updates resume towards the end of the month, your loyal BU will be married! 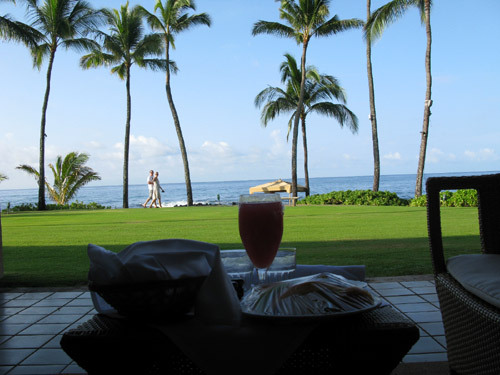 Room-delivered breakfast of fresh fruits, pastries, and guava juice on our private porch that opens up directly onto the ocean. 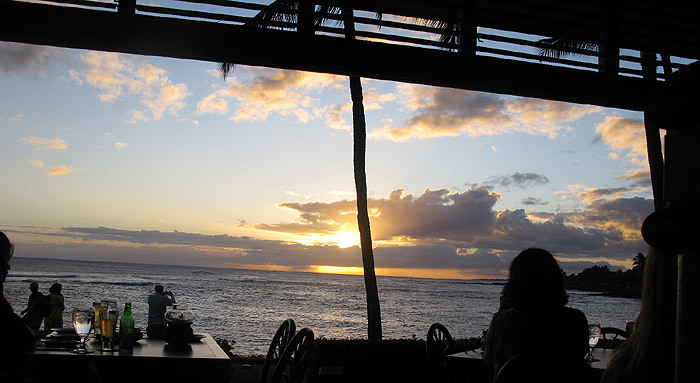 Sunset over Kiahuna Beach, following Free Mai Tai Hour. The view from our private cabana, just before we had our beachside couples massage. 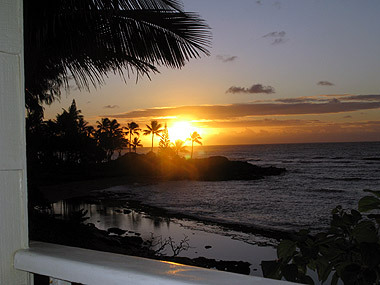 Our last sunset at the Sheraton Resort before leaving for the Kapa'a Sands Resort. 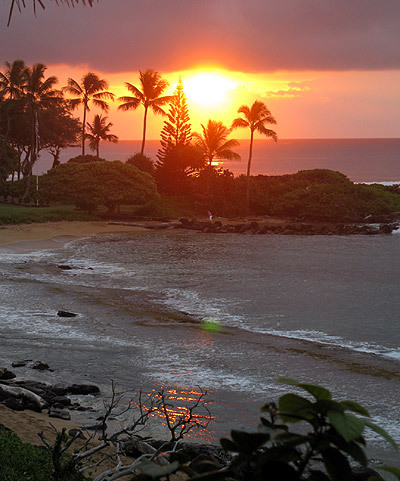 Sunrise over the eastern shore of Kauai, which is far cooler than the eastern shore on the mainland. This picture was taken by Rebecca right from our balcony (I was too busy sleeping). Sunset at the Beach House Restaurant (dinner courtesy of Kelley and Kathy). 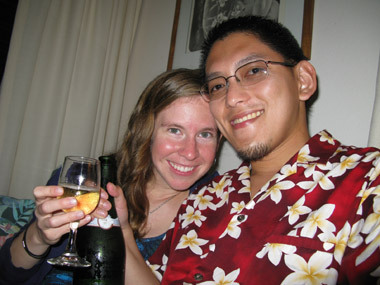 For this month's 12 of 12, we're on our honeymoon in Kauai, Hawaii! 6:42 AM: On the balcony of our condo at Kapa'a Sands, enjoying the sunrise and a breakfast of bagels, bananas, and peach-mango juice. 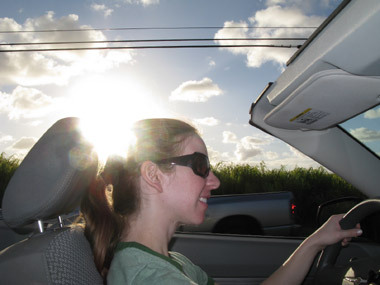 7:20 AM: Driving down the highway to the western side of the island in our rented convertible. 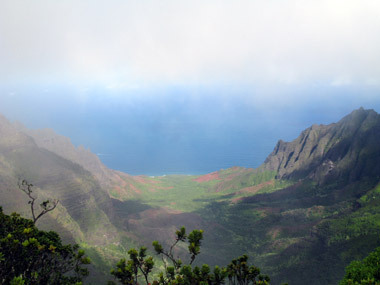 10:02 AM: After driving twenty miles up the length of the Waimea Canyon, we enjoy the view of Kalalau Valley from Pu'u o Kila Lookout, which is somewhere around four thousand feet above sea level. Because it's always in the clouds, it's either raining or very foggy. 12:02 PM: We hiked through the Alaka'i Swamp to Pihea Vista, which was a muddy rock scramble through the rain to a disappointing view. 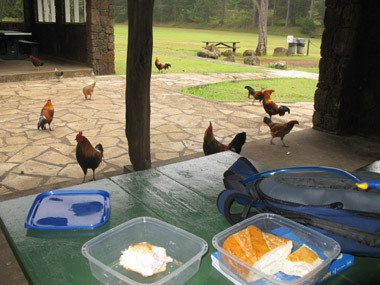 Rather than continue the two miles to the next lookout, we drove back down the canyon to the Koke'e Lodge and ate our packed sandwiches in the company of the wild chickens. 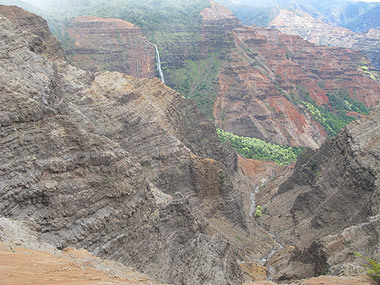 12:16 PM: We then drove a few miles down (to get out of the rain) and stopped at an overlook of the Waimea Canyon. 1:05 PM: Since you can only do some much in a canyon, we drove down to Kekaha next and spent some time on Kekaha Beach, where the sand is so fine that you sink in three inches whenever you walk. 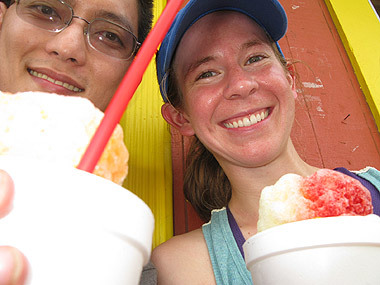 2:50 PM: After the heat of the west shore (where it's always sunny, even when it's raining on the other parts of the island), we had some Shave Ice at Jo-Jo's in Waimea. 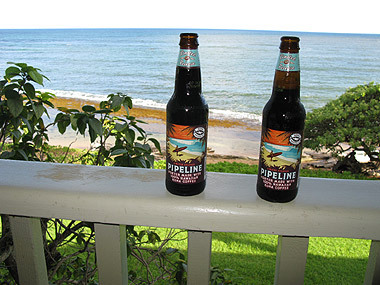 4:25 PM: After crawling across the island in what passes for rush hour traffic, we returned to our condo and had a couple Pipeline beers, made with Kona coffee. 5:34 PM: This is the beach/tidepool thirty feet below our condo. 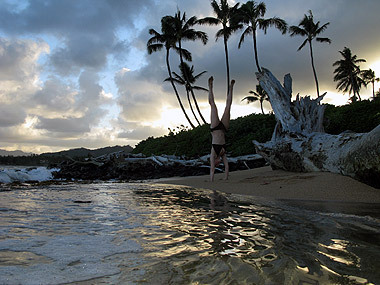 5:51 PM: Rebecca does a handstand in the sunset on our personal beach. 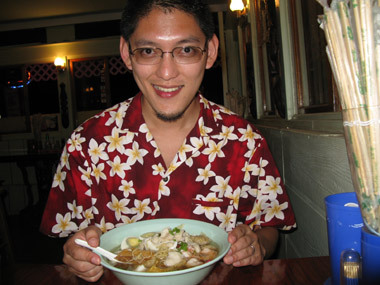 7:34 PM: We went to the House of Noodles to eat, where dinner was a bland but filling saiman for $25 total. This made up for the fact that last night's dinner ran over $120 at the Beach House Restaurant. 8:25 PM: We were given this bottle of champagne last week at the Sheraton, but I was unable to drink it at the time, being stricken with strep throat. 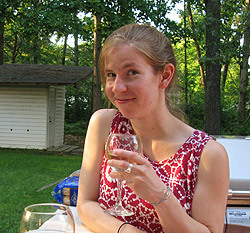 Fully recovered with antibiotics, tonight was the perfect time to pop the cork! 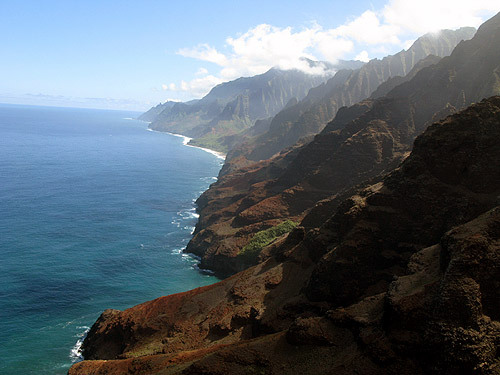 If you have the chance to go on a helicopter tour of Kauai, TAKE IT. 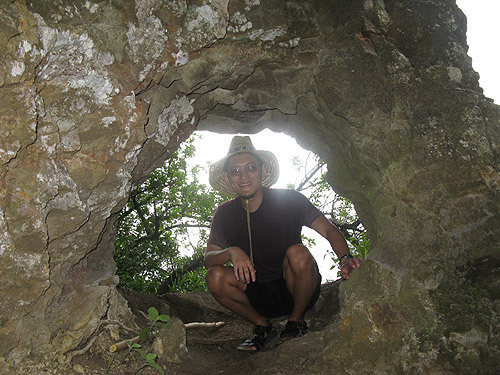 I'm sitting in the hole in the giant's chin, on Nounou Mountain. 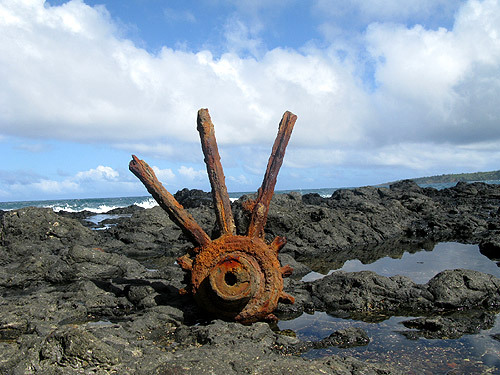 Today, we spent all day sitting or snorkeling at Anini Beach. 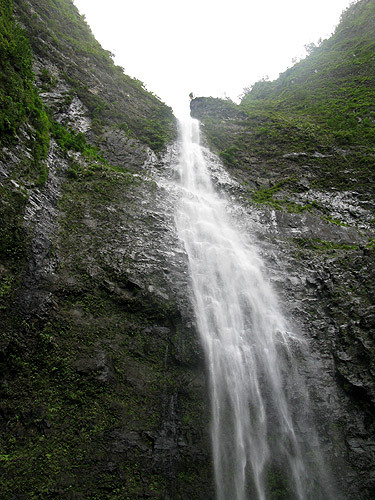 The Hanakapi'ai Falls sits at the end of an 8-mile round trip hike on the Na Pali coast. It took us six hours and twenty minutes, including all the time we spent dicking around the beach and the bamboo forests. 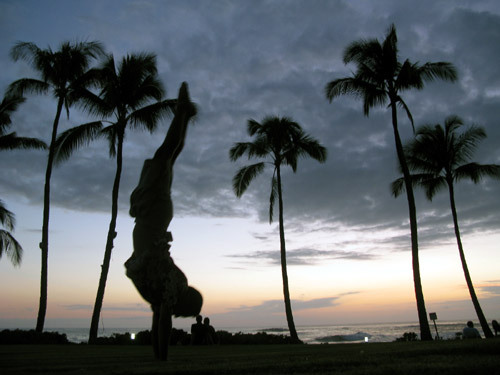 Sunset handstands on Kiahuna Beach. The Pools of Molokea, where ancient abandoned sugar mill machinery mixes with lava rock pools, was not as cool as the Secret Lava Pools, but this may have been because we left when we were still an 1/8th of a mile from the actual location (because of shoddy directions). 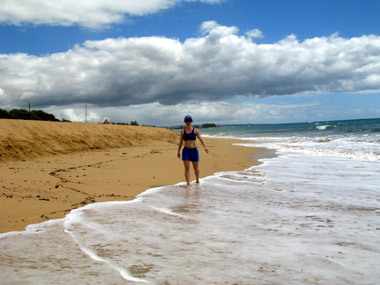 Today is our last full day in Kauai -- we fly out Monday afternoon and return to the east coast on Tuesday morning! Then we'll have to do something with the one hundred bottles of beer that people did not drink at our wedding. Perhaps we'll write a song about them. The handicapped always get the best views. 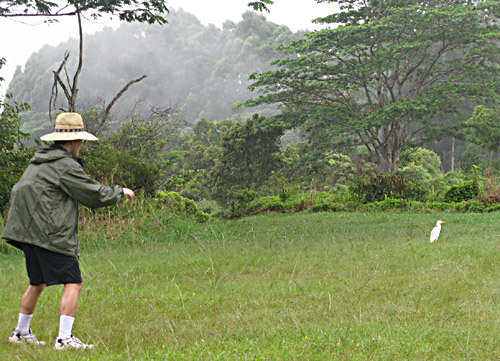 Hunting for dinner on the Kuilau Ridge. Obviously some sort of ancient native timekeeping sculpture. 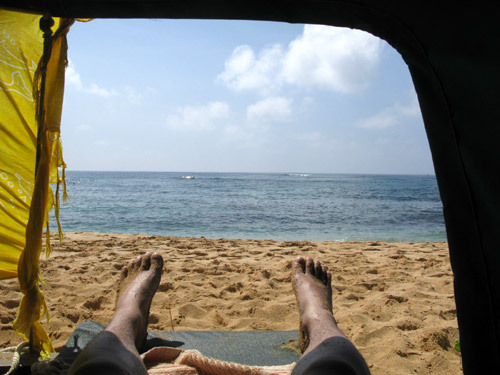 "Best Of Hawaii" will likely continue for the rest of the week while I get my act together. Updates that utilize more of the English language will resume next week. In addition, I am now using the jQuery LazyLoad plugin, which doesn't load images until they are scrolled into view on your monitor. This should make the News archives load a little bit faster and cut down on the bandwidth of loading an entire month's worth of pictures for someone interested in a single post. Please let me know if you like this feature, are indifferent, or find it to be a distraction. The official wedding pictures should be uploaded in the next couple of weeks! To the seven remaining visitors who chose to stick with the site through three weeks of me going all Pictures Pages on you, welcome back! I've been home since Tuesday the 20th, catching up on all the news and cheezburger content I missed while in Hawaii, and unpacking a slew of kitchen-related wedding presents that I plan to use in a Rube-Goldbergesque machine that will toast English muffins when my alarm goes off in the morning. The honeymoon was very relaxing, although jet lag made me sleep 14 hours the first night and then 2 hours the second night back. 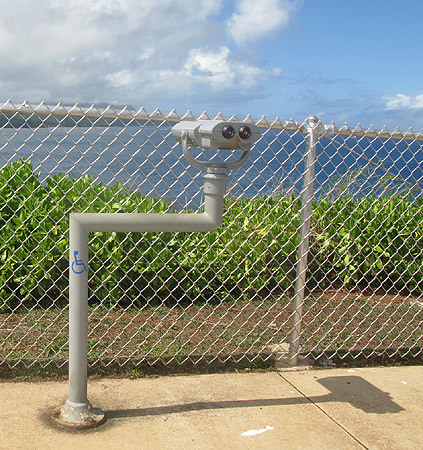 Because people hate when I do a miniseries, I won't be writing a consecutive travelogue of Kauai this month -- instead, I'll intersperse Memory Days with occasional Hawaii Days and tell bits and pieces of our trip throughout the rest of the year. Now that my life as a wedding planner is over, I have a laundry list of things I want to accomplish over the coming months (most of which I will still lack the ambition to get done, but writing them down counts as "trying"). "Month of Thanksgivings" is just around the corner, but I'll probably scale it back this year since eating leftover turkey for four straight weeks is not as fun as it originally seemed. "Anna's Halloween Party at My House" is also cancelled this year, but I'll try to come up with a fun costume for other area parties (while reusing the classics for parties with people I've never met before). Resume my self-studies of jazz piano. Add song info to 13 years worth of MP3s. Compose a new band piece. 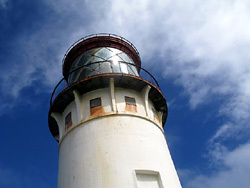 Learn how to use Photoshop CS4 in a structured, non-ad-hoc way. Take some random interest online classes through the free, yet poorly implemented, Skillsoft program at work. Learn to program with Google Web Toolkit. Write more reviews on Yelp. Learn enough to pass as a Database Administrator. Create maps for Half-Life 2. Redo the cabinets and appliances in the kitchen. Start an herb garden for cooking. Eradicate the creepy olive-sized spiders in the shed. Permanently mount my over-the-air HD antenna. 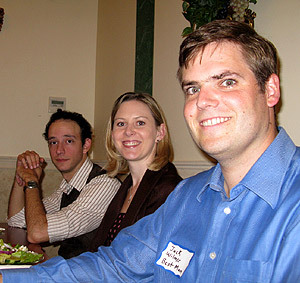 Hang out with more people in the vicinity who don't require a thirty minute drive to reach. Host the sixth annual Month of Thanksgivings. Create new photo albums for all the unsorted pre-digital pictures scattered about. Eat more disgusting foods, like fruits and vegetables. Work on the Paravia Wiki. At least 3 of the above. If you haven't been paying close attention so far, I got married three weeks ago and fled to Kauai, an island paradise which is the farthest western public island in Hawaii. 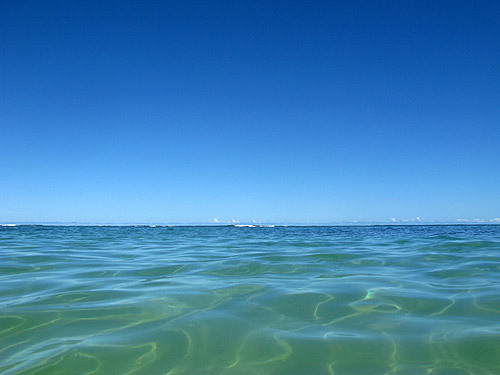 My oceanic travels are exceedingly limited, comprised of my Fresh Off the Plane trip from South Korea, and a 2008 trip to big cities in Europe. 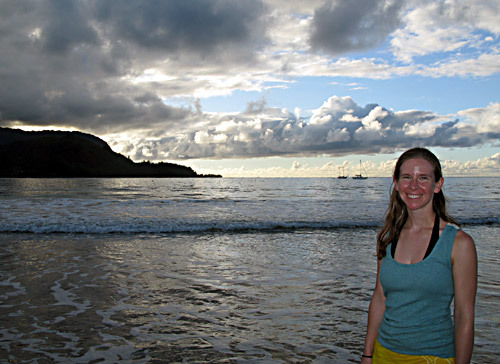 We chose Kauai because the Caribbean was in hurricane season, and there seemed to be enough varied activities to last us for the two weeks we wanted to spend. The fact that I didn't have to fill out any forms at work for leaving the country to face the dangers of converting to Communism was just icing on the wedding cake (exquisitely constructed by Anna's mom). The first thing that strikes you when you step off the plane into the pleasantly balmy humidity (besides the availability of the book, A President from Hawaii in every corner market), is the dichotomy of the landscape, with low-lying roads and forests rubbing shoulders with incredibly high volcano crater walls. 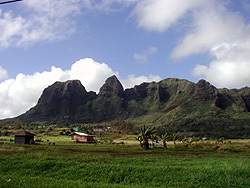 The island of Kauai doesn't even have the highest peaks of Hawaii (maxing out around 4000 feet above sea level) but for a guy from the perpetually flat Virginia area (where the Blue Ridge Mountains aren't allowed to be taller than the Washington Monument), they get the job done. The weather going into winter is perpetually between 70 and 85 degrees, and sporadic rain showers last between 1 and 6 minutes. In the wintertime (which includes October), there's occasionally a longer rain, but it's so localized that you can usually travel a few miles down the road for sunny skies. As you drive down Kuhio Highway, the first things you notice are the parties of wild chickens living in the bushes. The second thing you notice is the obscene number of PT Cruisers coasting down the roads -- my guess is that after they failed to become the "IT" car on the mainland, some salesman came up with the bright idea to ship the remaining 500,000 cars to an island populace who didn't realize that they weren't as cool as advertised (Hawaii is also a HORRIBLE place to play the License Plate game). It's unknown whether there are more PT Cruisers than wild chickens. For the second leg of our trip, away from the Resort, we rented a convertible for novelty's sake, so we didn't get to experience the PT phenomenon firsthand. However, we did drive through at least two parking lots where a Bingo card's worth of Cruisers sat in adjacent spots, like the poorly rendered background of a Dreamworks animated movie, where the artists got lazy with the Clone Stamp tool. 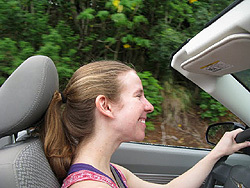 Driving in Kauai is generally on one or two-laned roads with a top speed of 50 miles per hour. Though this seems ridiculously limiting, everyone drive in a relaxed way, often stopping to let chickens cross the road (to get to the other side!) or to allow someone else to turn left across rush hour traffic. Congestion is heavy, but there's never a full-on traffic jam. The people are just generally more laid back, and the locals are just as friendly as advertised, their accents a strange mix of surfer and Minnesotan. We spent the first four days of our honeymoon at the Sheraton Resort, pampered and pandered to until the rhythm of work and weddings wore away. 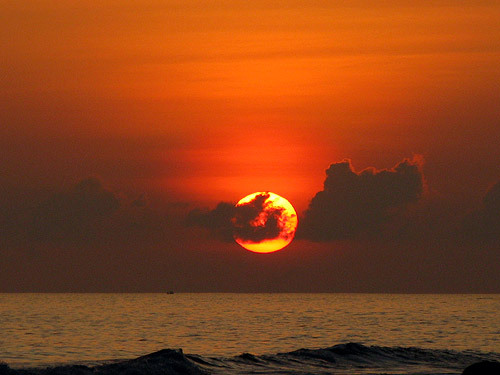 Once we had lost track of what day it was, we snatched up our convertible (choosing the less distinctive Sebring over the fire engine red Mustang) and started touring the island. 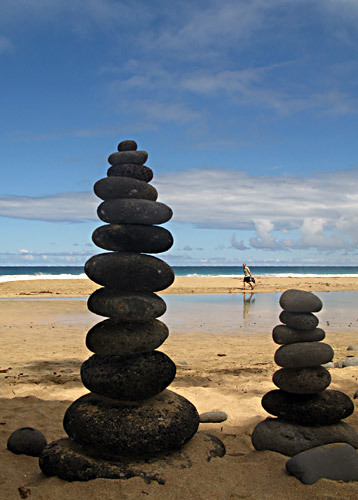 Our days were a perfect mix of beaches, hikes, delicious food, and sometimes just long hours by the pool. I picked up this CD on the strength of the single, "Sweet About Me". This is another case of a young singer (17) with a far more polished voice than you would ever expect, similiar to Joss Stone. Her songs are a mix of pop and blues, with a nice balance of ballads to hooks. The main complaint I have is that it's only 36 minutes long -- I can hold my breath for longer than that. You can listen to samples here. While researching this review, I realized that I never reviewed season three -- somehow in my world of intricate lists and comprehensive clutter, a product slipped through the cracks. So, season three gets a B+, since it was as good as season two and better than season one. With that out of the way, the fourth season is a struggle with an extra -uggle. Despite a few really stand-out episodes (like "The Three Day Rule"), the writers spend too much time dancing around who "Your Mother" is and employing the tired writing device of starting at the end of a story and wasting a whole episode on flashbacks up to where the half-hour began. 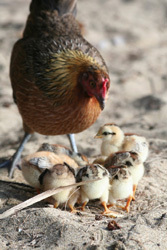 Before, it was obvious that "Your Mother" was just a backdrop to tell funny stories against. In this season, it's mentioned so often and with so little resolution that it's just annoying. I picked this book up to read on the plane to Hawaii, and then promptly read it in an evening during wedding week. It's a typical lawyer story in standard Grisham style (before he went all I'm-a-serious-writer-of-literature for a couple years back when), and as such, it works as a throwaway novel. 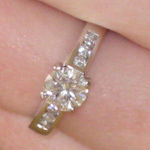 There's more resolution in it than The Partner and it's not as horrible as Testament. Of his more recent books, I'd still recommend The Brethren as his best. I watched this movie on the plane BACK from Hawaii, enjoying the novelty where every passenger had a personal screen upon which they could SELECT from a list of recently released movies and song albums. The plot is dense, but easy to follow, and is marred by a late-game twist, but it kept me entertained for two hours, even if it's implausible to think of Rachel McAdams as a "blogger". It was also fun to see all the actual shots of DC involved -- rather than going the normal route of pasting the Washington Monument in the background, they actually filmed in identifiable areas like Rosslyn, Ben's Chili Bowl, and a Metro station. 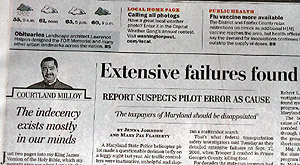 ♠ I don't really care for the new format and typeface of the Washington Post. It's as if people living in an Arial world suddenly rediscovered Times New Roman and thought it was a great idea, despite the past examples of New Coke and the original Roman Empire. Now it just feels like I'm reading a very liberal edition of USA Today with a harder crossword puzzle. ♠ When I was pretending to be a doctoral student at Florida State, we would gather for lunch at The Loop where my lunch would consist of the $2 side of fries and we'd tackle the USA Today crossword puzzle as a group. This got me into a daily crossword puzzle habit that ran from 2001 to the middle of 2004 (or right when I got moved to a project at work with tangible things to work on). ♠ My very first project as a full-time employee involved babysitting a consultant for days at a time while he tried to convince us that a content management system for posting news stories on an intranet was a good fit for managing all the documents in the Department of Defense. He would fly in on a Monday, write barely working code on Tuesday, and fly out on Wednesday. Thursday and Friday consisted of us trying to make his code work. ♠ Speaking of work, they stock Coke Zero in the free soda fridge at work now, although this might have been a fluke, since I drank it all this week and it hasn't been restocked yet. 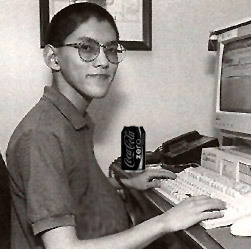 Still, three Coke Zero's a day is far healthier than my internship -- remember when I was drinking a 7-UP every hour? ♠ I didn't originally plan to have all my images be black and white this morning, but an occasional palette cleansing is highly recommended. Try the ginger. ♠ Plans for the weekend include three Halloween parties in two days, spaced over forty miles and in a straight line, such that when you draw a line between them all, you get a straight line. This year's costume is better than 2008's Ugly Betty, but not as good as 2007's Very Special Kwanzaa Box, so I may decide to whip out my box for old times' sake at one of the parties. I also plan on coming up with a delicacy to replace cheese soup that's easier to make and fits in better with a Thanskgiving dinner while Rebecca hops off to Front Royal for some kind of candle party (Colonel Mustard did it).